Are you missing some teeth? A fixed dental bridge may be the the simplest permanent solution for you. Having one or more missing teeth can have a serious effect not only on your smile, but also on your dental health. 1. A shift in the alignment of your teeth. 2. Increased risk of periodontal disease. 3. Increased risk of tooth decay. 4. Loss of adjacent teeth. Like dental implants, dental bridges in Mexico are used to replace a missing tooth. Bridges are supported by the teeth on either side called abutment teeth. Both crowns and most bridges are fixed prosthetic devices. Unlike dentures, which are removable devices which you must remove daily to clean, crowns and bridges are cemented onto existing teeth or implants. In Tijuana dentists have a lot of experience with these treatments. Like many A bridge may be recommended if you’re missing one or more teeth. Gaps left by missing teeth eventually cause the remaining teeth to rotate or shift into the empty spaces, resulting in a bad bite. The imbalance caused by missing teeth can also lead to gum disease and “TMJ”. A dental bridge in Mexico will improve your ability to chew and speak as well as your smile. In a recent study published in the Journal of the American Dental Association, dental bridges were shown to dramatically reduce the risk of losing teeth that are adjacent to a missing tooth. In addition, dental bridges can help keep your jaw and face from changing shape, as they tend to do when a person has missing teeth. Traditional fixed bridges are the most common. They literally bridge the gap of an empty tooth space by securing a false tooth using crowns on the abutment teeth on either side. 4. Porcelain fused to also white ceramic, known as zirconium. Each one has its characteristics. The standard materials work well and are the least expensive. Gold is the most malleable, and makes a great seal, but is also the most expensive, and is not so aesthetic. Zirconium makes the best bridges because it is harder than steel, and is white, and for front teeth it is very aesthetic. Also, because zirconium is so hard, it could never sag. Sometimes with a long bridge, if it is made with a metal foundation, it can actually bend or sag a little in the middle. How Are Tijuana Dental Bridges Placed? A Tijuana Dentists is a very common type of dental work in Tijuana, done by your Tijuana dentist. The procedure of installing a dental bridge is typically completed in two visits. 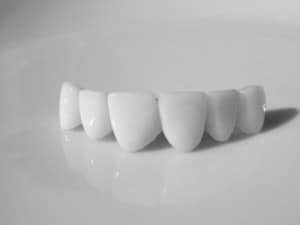 First, your dentist will determine if you are a good candidate for a porcelain bridge. Before either a crown or a bridge can be made, your teeth will need to be prepared by reshaping or reconstructing any badly decayed or damaged areas. The tooth (or teeth) must be reduced in size so that the crown or bridge will fit over it properly. After reducing the tooth/teeth, your dentist will take an impression to provide an exact mold for the crown or bridge. If porcelain is to be used, your dentist will determine the correct shade for the crown or bridge to match the color of your existing teeth. After your dentist takes an impression of your teeth,it is then sent off to a lab where it is cast into a mold, and give you a temporary bridge to wear. On your second visit, this mold will be fitted to your teeth, and any necessary corrections or adjustments will be made on that same visit. While crowns and bridges can last a lifetime, they do sometimes come loose or fall out. The most important step you can take to ensure the longevity of your crown or bridge is to practice good oral hygiene. Normally dental bridges can last from 8 to 15 years and can last even longer if you maintain good oral hygiene. A bridge can lose its support if the teeth or bone holding it in place are damaged by dental disease. Keep your gums and teeth healthy by Brushing with fluoride toothpaste twice a day and flossing daily. Also see your dentist and hygienist regularly for check-ups and professional cleanings. The average price of Dental bridges in the USA is around $850 a tooth, and can cost $2600 for a 3 tooth standard bridge. At Samaritan Dental Tijuana, Mexico, the cash price for a dental bridge is $270 a tooth, for standard porcelain bridges. For the top quality zirconium base bridges, the cash price is $460 per tooth or unit. To find out more about bridges or to schedule an appointment, call Samaritan Dental Tijuana, your Tijuana Dentists today!